I recently decided to re-organize my bookshelves. Actually it was a new cookbook that prompted this decision, since when I tried to find a spot for it on the right shelf, I realized I couldn’t; not only was the shelf full, the entire bookcase was too. Luckily the one across the room still had some space I could hijack, so I set to work redistributing and rearranging, and in the process, rediscovered a number of books I had completely forgotten I owned. One of these books gave me a fright when I pulled it off the shelf. At first glance it looked like its top end had been stuck into a paper shredder; on closer inspection, though, I realized the book was just full of bookmarks, ragged little strips of paper poking out of the top like a shock of messy hair. Suddenly it came back to me: this book was a relic of a particular phase in my constantly-evolving recipe-bookmarking strategy. Circa late 2006 my modus operandi when I brought home a new cookbook was to sit down with it and diligently mark the location of each and every recipe I wanted to try with a little scrap of paper. At first I tried to be organized and bought an array of multicolored Post-It notes; when those ran out I moved on to carefully-cut rectangles of white printer paper, and when I could no longer be bothered to make those, scraps of whatever paper I could find lying around: old utility bills, supermarket receipts, used envelopes. The idea was, obviously, to be able to easily find those recipes again, but also to remind me whenever my gaze passed over the book on my shelf that there were dozens of worthy recipes inside patiently waiting to be made. What I didn’t take into account, though, is how quickly you become blind to something you see every day. The book in my hand, I realized as I turned it over, I had probably spent hours poring over, planning, salivating and bookmarking—and then never opened again. Suddenly I felt very melancholy. I noticed as if for the first time how many books on my shelf still featured those little paper fringes, each tattered slip representing a potentially life-changing recipe I never got around to making. Not only that, this was only the visible tip of the iceberg; in all the un-bookmarked books (by far the vast majority) there are no doubt hundreds, even thousands more. Suddenly one of my most basic assumptions—that one day I’ll cook my way through each and every book on my shelves, mining it for gems, learning everything it has to teach me—seemed utterly absurd. At the rate I’m currently going, cooking just as often from the internet as from books, getting stuck on things I like and cooking them multiple times, and worst of all, constantly expanding my book collection(! ), I’ll be lucky if I ever get around to making one one-hundredth of the recipes currently on my shelves. But even if I never bought a new cookbook, and made a new recipe out of these every single day of every single week of every single year, it would take me somewhere around 125 years to get through my whole library. In other words, my recipes have far outstripped my lifetime; I’ll die never knowing how most of these dishes taste. But then I looked down at the book in my hand, at all those little scraps of paper crookedly saluting me, and I realized that maybe I was looking at things the wrong way. I may have more recipes than I can ever work through, but maybe that’s also the upside: I’ll never run of new ones to try. And feeling a little more cheerful, I finished my bookshelf reorganization, took that fringe-topped book into the kitchen, and made three of those long-ago-bookmarked recipes for dinner. The cookbook I rediscovered that night was an early one by Anya von Bremzen called Please to the Table: The Russian Cookbook. I don’t know if its non-enticing regional focus was the reason I ignored it for so many years, but in case you’re also in possession of this book don’t make the same mistake. In fact the title is more than a bit of a misnomer, since the scope of the book extends far beyond Russia to all the countries of the former Soviet Union. That in itself makes it a fascinating read; it was written just before that enormous and diverse country splintered apart and while it was still perfectly legitimate to pull together recipes ranging from Russian dumplings, Ukrainian borscht, Azerbaijani pilafs, Uzbek kebabs and Georgian salads into one collection. There’s really a lot of exotic stuff packed in here, but the best part is von Bremzen herself; if you’re familiar with any of her other books such as the phenomenal New Spanish Table, or her wonderful writing in Travel and Leisure, you know that she’s a gifted storyteller with fabulous taste. I count her among the few food writers I trust implicitly; when she says something is good, I’ve learned to listen. The dishes I made for dinner were no exception. There was an Armenian pumpkin moussaka, layers of dense, sweet squash interspersed with spicy ground beef, crunchy pine nuts and creamy béchamel, and there was an apricot-laced red lentil soup, sour with lemon and warm with cumin. Our favorite by far, though, was the spinach pkhali. It’s a Georgian recipe, an intensely aromatic spinach salad/dip hybrid that features what I’ve come to recognize as the country’s holy trinity of flavors: walnuts, garlic, and a haunting herb-and-spice blend that offsets the biting freshness of cilantro and tarragon with the bitter, aromatic edge of fenugreek. 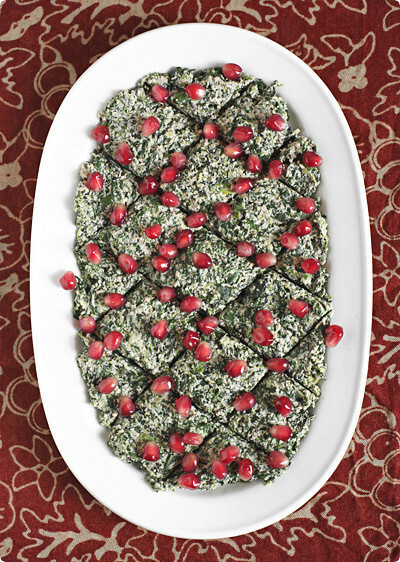 Sprinkled with crunchy sweet-tart pomegranate seeds, the flavors were electrifying. I felt like my tastebuds were learning to speak a whole new language. I was actually so enchanted by that pkhali that I woke up the next day determined to unearth as many of the recipe gems still lurking on my shelves as humanly possible in the years I have left. I felt so inspired, in fact, that the first thing I did was log on to amazon and order a whole bunch of new books to dig through. Pkhali (the ‘kh’ is pronounced as a deep, guttural ‘h’) is a whole class of Georgian vegetable dishes that straddle the line between salad and dip. The constant is the walnut sauce, and the fact that the vegetable is cut very, very finely – almost (but not quite) to a puree. Beet pkhali is also very popular, and is often served alongside the spinach; to prepare beets this way, wrap 3 large ones in foil and bake until soft, then peel and finely chop (or pulse in a food processor) before mixing with the sauce. If you’d like to substitute frozen spinach in this recipe, I imagine it would work, though I’m not sure about the amount; maybe start with a pound (half a kilo) of the frozen stuff and add more as needed to balance out the flavors. p.s. After making this again, I’ve decided I like a slightly smaller amount of spinach, to let the flavors of the walnut sauce really shine. Alternatively, you could use the full 2lbs and make one and a half times the sauce. Bring a large pot of salted water to a boil, add the spinach and cook just until tender, about one minute. Drain well and let cool. When manageable, wrap the spinach in a clean kitchen towel and squeeze until nearly dry. Chop it as finely as possible (don’t use a food processor or blender, which may puree it; it should have texture) and set aside. In a blender, combine the walnuts, garlic, coriander, fenugreek, cayenne and vinegar. Add 3 tablespoons of warm water and blend until you have a smooth, creamy sauce about the consistency of mayonnaise, adding a little more water if needed to get things moving. Add the walnut sauce to the spinach and stir until thoroughly blended and smooth. Stir in the minced onion, cilantro and tarragon, and season with salt to taste. Cover and refrigerate for 6 to 8 hours to allow the flavors to blend. Taste again before serving and adjust the salt and vinegar if needed. To serve, spread the pkhali on a plate and smooth the top with a spatula. With a knife, make a pattern of diamonds in the top, and sprinkle with pomegranate seeds (or, in a pinch, walnut pieces). Serve with bread. I have a whole 'nother problem–I tend to make my own recipes up! I really never get around to trying those I've bookmarked in books and online… I've found that the best strategy is to buy books about cooking, like On Food and Cooking, Culinary Artistry or Kitchen Confidential. I like to read about food and about cooking, but there's only so much room in my repertoire for new recipes! On Food and Cooking did inspire me to try a meringue cookie for the first time, though… I would consider that a success. I rarely feel overwhelmed by choice. I have people here who keep asking for the same recipes and keep me solidly on the grounds of Italian cooking. However, I need to make some room for my latest order in cookbooks, and I'm sure I will rediscover some gems. The internet is also a very dangerous place (speaking of which, I am going to try this one, and skip the other recipes I bought the spinach for). However i often borrow cookbooks I normally would not buy from my local library, and I am appalled by the amount of boring ones out there. With so many good one, their existence is a great mistery for the humankind. Lovely blog! I'll have to do more travelling – and more eating!!!!! Melissa, I still tend to do that with new cookbooks – insert little strips of post-it notes to mark recipes I'd love to try. One day. I the distant future 🙂 I haven't got that book by Bremzen, and I haven't tried a spinach pkhali. However, I made a wonderful beetroot pkhali several times last year, and you've just reminded me that I still haven't blogged about it :OPS I've come across different spellings – both pkhali and mkhali. An Estonian friend of mine with Georgian background suggsted I use the latter for Estonian audiences. Confusing, isn't it?! I thought this post was a lovely read. It is also great to be inspired by totally new recipes and flavors. Here on the internet it feels like things go in trends and the same recipe shows up all the time on one blog or another. So thank you for these exciting new ideas. Hehe… Story of my life! I worked in a bookstore for 8 years where I received a substantial discount, so you can only imagine the number of cookbooks I ended up with (I just moved and I think it was something like 20 boxes worth!). And yet, I still buy new ones, although I am trying to rely on the library a bit more these days though, to try to suss out which ones are truly "necessary" to purchase.I currently have "Breath of a Wok" by Grace Young checked out; the first 65 pages are all about wok history, culture and technique. Even if I don't make many recipes from this book, I like to think I'm still getting a lot out of it technique-wise.I love Von Bremzen's "New Spanish Table"; thanks for pointing me to this earlier work. I don't have much of any Eastern European cookbooks and the flavor combination sounds very intriguing! I think another trip to the library is in order. YES YES – Georgian food! After my first trip to the country last summer I wonder, WHY on earth aren't there MORE Georgian restaurants abroad? The khinkali dumplings, the khajapuri – like a cheese stuffed pizza, the lobio, mmmsatsivi, the eggplant, the cheeses, the simple salads – and yes you have hit it right on the head – the mixture of walnuts, garlic and haunting – so aptly put as I know that I sat there bite after contemplative bite trying to discern what EXACTLY was that mix of spices – coriander, tarragon… addictive, gorgeous, so flavorful. So specifically Georgian. I was just in Moscow for the first time and while I was anxious to try some Russian homecooking, I also had to try out one or two of the amazing Georgian restaurants in town. Mmmm. Thanks for posting this recipe, can't wait to try it! Let’s see, inauthentic elements of Please to the Table . . . .ummm . . . 1.) Olive oil. Central Asian’s generally don’t cook with olive oil. It lends a powerful flavor that is not well appreciated. They love olives, but tend to use other oils for cooking. This changes and westernizes many of the dishes – especially the salads in Please to the Table.2.) Too often, “Italian” flat-leaf parsley is substituted for cilantro – completely changing and westernizing the flavor of the dish. Especially true, once again for salads where flavors tend to be fewer than in a stew or curry etc.3.) Red wine vinegar instead of white vinegar or cider vinegar is another westernization. Sometimes the Armenians and Western Georgians use red vinegar, but its use drops off precipitously as one moves east.4.) Lima beans usually would be fava beans – from the Arab and Persian influence throughout the area.5.) Bulgarian feta pales in comparison to Georgian cheese – a better match for suluguni is whole-milk Turkish feta. This may not have been easy to find when “Please” was published.6.) Chili peppers in general are omitted in favor of sweet and hot paprika – this changes the heat of most dishes – dulling them down and is catastrophic for the adzhika chili-based condiment.7.) Frozen spinach – egad – no comment8.) Dried, sour plums are now available in the west – no need for acrobatics with oolong tea which does not (IMHO) replicate the flavor of dried, sour plums at all.9.) The recipe for adzhika is ridiculously wrong. That visitation of hell to Georgia ought to have 1 cup of hot chili peppers or an equivalent amount of ground hot chili peppers not a wimpy amount of sweet and hot paprika.10.) The Khmeli-suneli recipe is wrong. Georgian’s do vary the recipe a lot, but oregano is generally not included – except occasionally in the far west of Georgia. Using parsley, oregano and tarragon produces a western spice mixture, but it is not khmeli-suneli. (What no marigold? )Lots of other things are off about Please to the Table but they are difficult to put one’s finger on. Examples of “Moldovan” recipes are given that are eaten from Moldova to Kirgizstan – these recipes are much different in Central Asia (like the cheese stuffed peppers); Pumpkin fritters with a different spice set are often offered as snacks or part of a light meal with soup – not only as a dessert or breakfast food. Ingredients are missing – whether they are spices or other vegetables in a salad. For an example of the latter tomatoes or bell peppers are often used in salads to accompany daikon – and this matters to the overall flavor of the dish.These are some examples, I found in 10 minutes. I could find more, but have a life, a job I must get to, and generally don’t like to tear other’s work down – even if it is unauthentic or wrong. But you did ask.I have a great deal of respect for Von Bremzen’s book. The mistakes in it were one of the things that made me want to write an authentic series of books – hence the Silk Road Gourmet Volume 1– which covers Armenia, Georgia and Azerbaijan, and the upcoming Silk Road Gourmet Volume 2 which covers Central Asia, the Himalayas and the Indo Pacific. Please to the Table was an inspiration, and so was eating many of these cuisines in situ – there is no substitute for that. Oh my goodness, I just realized I have been to your blog. You have the wonderful peanut butter soup recipe. I end up bookmarking things on my blog reading journeys — my new cookbooks — and I forget that I've picked some up and read a few good chapters and then put it back down. My sincerest apologies. I's almost too pretty to eat! Wow this looks great. Cookbooks are a the history of cooking throughout life. You don't read them you devour them…. I've used this recipe you posted several times now — it is perfect for my church's lenten periods. The first time I made it, my husband, who avoids dairy foods, thought it must be "loaded with cream cheese." It was hard to convince him otherwise. I made it first with frozen chopped spinach, because I always have a lot of that around, and everyone liked it very much. (I can hardly stop eating pkhali, so I make a point of taking it to potlucks to limit my consumption.) But last time I made it with fresh spinach, and that definitely took it up a notch. I used Costco baby spinach, and I thought perhaps the lack of stems to cut off made the quantity of spinach too much for the amount of sauce — I had to add a lot more sauce ingredients in the end, but the result was fantastic. The combination of flavors is genius, the fruit of centuries of creative cookery, I'm sure. In spite of one commenter's word on the inauthenticity of tarragon, I would not leave it out now that it is part of the recipe I love — and which has proved that tarragon and walnuts *do* go together — and will pass on via my own blog. Oh, and the last time I made it, I also made a loaf of the bread the Eritreans call himbasha, on which to spread the pkhali, and they turned out to be a perfect duo. I want to clarify that it was to the recipe as originally posted here that I needed to add more sauce ingredients. I just noticed that it had been updated.